What the scientists did here, as others who study and publish on the climate have also done with other topics, is a nice bit of over-inclusion of data. The point at issue is measuring the warming of lakes that have a man-made warming influence, such as being used for cooling at a factory, or for an electrical power plant. An example, and I do not know if this lake is included in the study, is the lake that provides cooling to the Comanche Peak nuclear power plant near Granbury, Texas (just south and a bit west of Dallas). 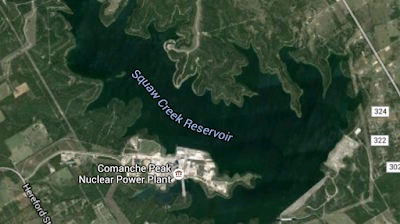 The lake is Squaw Creek Reservoir, and the nuclear plant is built on a peninsula reaching into the lake from the west. (see photo). Comanche Peak is not the only power plant that obtains cooling from a lake, as more than a few such nuclear plants draw cooling water from the Great Lakes; Cook Nuclear Power Plant on Lake Michigan is another example. It is not only power plants that draw cooling water from large lakes, many industrial plants such as oil refineries also do this. Still, the lake temperature report apparently has a few lakes that showed a cooling trend. Two reasons the scientists gave for this are 1) shading by trees that block the sun (highly unlikely for a large lake), and 2) meltwater from glaciers. (again, highly unlikely for the lakes in Florida that are cooling). "Even lakes at the same latitude, which might be expected to have similar responses to warming, showed big differences. “That kind of variation was a big surprise,” " according to one scientist. When the lakes' temperature study is published, it will be interesting to examine the data and determine which artificially heated lakes are included, and what the scientists will do about that. Meanwhile, the pristine areas of the US show a cooling trend for air temperatures. It will be quite interesting to watch the trend of pristine lake temperatures.